The David and Gladys Wright House (DWH) has launched a new tool to appeal to the global interest of the home in Phoenix, Arizona. 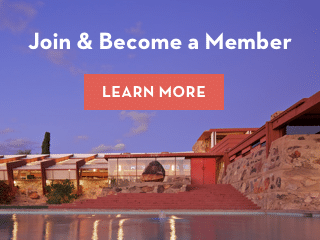 While public tours of the home are temporarily closed – as we work on securing a partnership and establishing cultural programming with a known philanthropic institution – the DWH will offer website visitors a glimpse into what is considered Frank Lloyd Wright’s last residential masterpiece. Situated near the base of Camelback Mountain, the home was designed by Wright for his son David and daughter-in-law Gladys. The home was originally titled, “How to Live in the Southwest,” in Wright’s plans. A map of the home, as seen below, allows users to pick a point in or outside the home, and see photos of that area. Web visitors can see in fine detail the unique dwelling’s circular patterns, hand-cut Philippine mahogany, custom-designed furnishings, as well as its pastoral setting near the base of Camelback Mountain. The virtual tool also contains archival photos, allowing users to travel back in time to the 1950s. To explore the virtual tour, click the map below!